Kevin Ozier, who started his career as a walk-on, will finish his senior season at Arizona State on Monday in the Holiday Bowl in his hometown of San Diego. TEMPE, Ariz. — As Arizona State receiver Kevin Ozier went to meet with coach Todd Graham for the first time, a heavy burden weighed on his shoulders. Ozier, a walk-on coming off his third season with the Sun Devils, had roughly $4,000 in tuition debt from the previous semester. He wasn’t sure he would be able to register for classes and continue his career at ASU. Graham, hired in mid-December of 2011, was settling in to his new position and taking stock of his team. He set up individual meetings with each player on the roster, hoping to understand each player’s situation. Ozier introduced himself to Graham, who asked Ozier how everything was going with school. "School’s good, except I have a lot of tuition I owe," Ozier said. "Well, I hope you can get that taken care of," Graham replied before suggesting a staffer could help Ozier find a job. The problem was, Ozier already had a job. He’d had a few during college to cover tuition costs. He’d gone his first semester at ASU without a permanent residence, at times sleeping in his car, and gotten by in classes mostly without his own books. Ozier stood up to leave Graham’s office, worried as ever, when Graham stopped him and asked for his jersey number. Graham had been watching film and then knew most players only by their numbers. "I was like, ‘I’m No. 82,’" Ozier recalls. "Then he says, ‘Oh yeah, we watched film. I like how you play, and you work hard.’ He said, ‘Don’t even worry about tuition. We’re going to put you on scholarship.’"
In that moment, Ozier felt the burden lift. Ozier’s long journey — or at least the collegiate leg of it — comes to an end Monday when ASU plays in the Holiday Bowl, giving Ozier the chance to display to his hometown of San Diego just how much his perseverance paid off. "Tough people come out of tough times, and Kevin’s one of the most exceptional walk-ons I’ve ever had," Graham said. "He took the hard road to get here — a long, slow, hard, tough road. I couldn’t be more proud of him." Ozier hasn’t always been a wide receiver. He was until one day he wasn’t, after a coach at Mira Mesa High School watched Ozier throw a ball back after running a deep route. "They said, ‘Come over here, you’re playing quarterback,’" Ozier said. "I was like, ‘Aww, dang.’ I didn’t want to play quarterback." Ozier did what his coaches asked. He led Mira Mesa to two playoff appearances, but the position change might have hurt his chances at landing a Division I scholarship. A few schools considered Ozier as an athlete. Colorado State showed interest but never offered a scholarship. Oregon State wanted Ozier but had no more scholarships to offer. At the end of the recruiting process, Ozier hadn’t a single offer at any level. "If I’d had any offers, I would have taken one," Ozier said. If I’d had any offers, I would have taken one. Without a scholarship, Ozier wasn’t sure what to do next. "Kevin didn’t think he could go to college because he didn’t have a scholarship," recalled Valerie Medina, Ozier’s mother. "But I was telling him, ‘Yes, you can go, you can still go to college.’"
Ozier could have enrolled at a local junior college and played his way into a Division I scholarship, but that path didn’t appeal to him. "I know people who I grew up with that went to junior colleges in San Diego and that’s all they did," Ozier said. "They’re at home in San Diego not doing nothing with their lives." That left one option: Walking on. Ozier wanted to stay close to home, but not too close, and he wanted to play Division I. His cousin, J.R. Redmond, who starred as a running back at ASU from 1997-99, suggested Ozier consider the Sun Devils. "I just pretty much told him, ‘You should go to ASU. You have the type of talent that you should be playing Division I football. You just need the opportunity,’" Redmond said. Redmond made the drive to Tempe with Ozier. There, Redmond introduced Ozier to the coaches he knew on Dennis Erickson’s staff. Then-offensive coordinator Rich Olson told Ozier that the Sun Devils had no scholarships but that if he walked on and worked hard, he might get one in two years or so. Ozier accepted the challenge, though he didn’t know then just how hard it would be. "Some people would rather just go to a junior college or go to a Division II school and just say, ‘I’m going to take what I can get,’" Redmond said. "Kevin didn’t do that. He said, ‘I’m going to make my own opportunity.’"
Olson had told Ozier the greatest challenge for a walk-on is the first year. Ozier and his mother quickly found that to be true. "When he got accepted at Arizona State, we never thought it would cost so much," Medina said. "He wanted to quit because it was such a struggle, but I told him, ‘No, we’ll find a way to make it happen,’ and we did." Medina went to great lengths to help Ozier make things work at ASU. She sold her 2004 Ford Explorer to pay first-semester tuition, and she swallowed her pride on numerous occasions to ask others for help. "She would ask people that I didn’t even know, people that she worked with, ‘My son’s going to college, can you help out?’" Ozier said. "She would just ask — people at church, everywhere. I don’t really like asking people for things, but she would ask. "She did everything she could." Ozier’s father wasn’t in the picture the way his mother was. They would talk, Ozier says, and his father was encouraging and proud but couldn’t help in the way his mother did. Despite all Medina’s efforts, Ozier still came up short of all the costs involved in freshman year of college. He didn’t buy any books, instead borrowing them from teammates who were taking the same classes. He didn’t have a meal plan either, and under NCAA rules, walk-ons are not allowed to eat the meal provided to scholarship athletes. When he was on campus, friends would get him into the student cafeteria with their meal plans. Other times, Ozier would sneak in and stock up on fruit when he left. More troublesome was that Ozier couldn’t afford to live in a dorm. Ozier filed an appeal to live off campus as a freshman. He spent the first few nights of college with a friend of his mother in Avondale, more than half an hour from campus. He quickly realized getting up before 5 a.m. daily to make 6 a.m. workouts would take its toll, and the friend moved shortly after Ozier got to ASU anyway. A friend from Mira Mesa, Kawika Lawlor, had also come to ASU and knew another freshman in his on-campus dorm whose assigned roommate never showed up. Lawlor asked the friend if Ozier could leave some things there and sometimes spend the night. The friend agreed, and Ozier now had a place other than his car to keep his clothes and belongings. But Ozier didn’t have a key, so some nights, when no one was home or Ozier got back too late, he had no choice but to sleep in his 2003 Nissan 350Z, which an uncle had given him, parked on a dark street or in a parking garage. As hard as that was, Ozier was able to maintain perspective. "There’s people sleeping outside, so as tough as it was for me, I remember downtown San Diego, there’s a couple blocks where it’s just homeless people with blankets, sleeping bags and tents," Ozier said. "I still have enclosed area to sleep in, a place to lay my head." Kevin Ozier received his degree from Arizona State at the end of fall semester, becoming the first member of his family to graduate from college. On top of all the challenges her faced just making it as a college student, there was football, the whole reason Ozier had come to ASU. Ozier knew his role as a walk-on freshman: play on the scout team and try to help the starters get better. Still, he knew scout-team repetitions were his chance to get noticed. "I took it seriously, like it wasn’t scout team," Ozier said. "At practice, I would try to simulate what the receivers do. I didn’t take it just like, ‘Oh, OK, I’m not playing, so I’m just going to be out here messing around.’"
Going up against established defensive backs such as Omar Bolden and Terrell Carr, who urged him to hold nothing back, Ozier went all out. He watched film with then-defensive backs coach Greg Burns to learn the traits of opposing receivers ASU was set to face. Ozier wasn’t sure if he was getting noticed, but he kept working hard. The grind of practice, classes and a side job at J.C. Penney caught up to him, though. After finishing with classes around 1:30 p.m., Ozier went to football meetings at 2. After that was practice until 6 before hurrying to work for a shift, which during the holiday season lasted until midnight at less than $10 per hour. Exhausted and stressed, Ozier more than once thought about giving up at ASU and heading back home. "He thought because it was such a burden on me (financially) that it would just be easier for him to quit and come home and maybe check into a school here," Medina recalls. "I told him, ‘No, Kevin, we can do this. Just hold on.’"
Eventually, things started improving on the field and off. At the start of second semester of his freshman year, Ozier found a new place to stay with teammate Jarrell Holman, a safety who had an empty room at his apartment. Holman asked Ozier to help with rent if he could but knew how tough it was for Ozier as a walk-on. Ozier also got a more manageable job in customer service with the campus housing office and bought groceries for the apartment with his government assistance card. Ozier started getting noticed more on the field during his second season. His hard work had caught the attention of Jamie Christian, ASU’s inside receivers and special teams coach. Christian told Ozier he had potential and started looking for ways to get Ozier on the field. ASU had brought in offensive coordinator Noel Mazzone, who ran an up-tempo offense. The new offense created more opportunities for Ozier to get on the field the next season, and he earned a key special teams role, which meant he got to travel with the team. 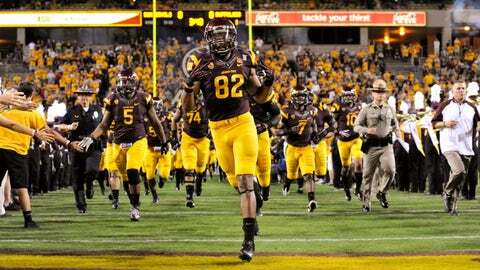 On Oct. 29, 2011, Ozier caught his first collegiate touchdown pass against Colorado at Sun Devil Stadium. Both his parents were in the crowd to see it. Things were looking up. After his first touchdown, Ozier began to hear praise in practice from teammates, who would shout "Give him a schollie!" after he made a play. Erickson had told Ozier he would be put on scholarship after the season, but the team went into a tailspin after the Colorado game, losing five straight games and making his future at ASU murky once again. "Rumors were around that Coach Erickson was getting fired or he has to resign or retire, and I was like ‘Oh, noooo,’" Ozier said. "I felt like I’d put in all this hard work, and it wasn’t even about getting a scholarship at that point. It was about, ‘I can’t pay for school anymore.’"
When Graham told him he was being put on scholarship, Ozier did his best to remain calm. "I didn’t want to jump up and down in his office, but my face lit up," Ozier said. "My eyes probably got watery a little bit. I shook his hand and I told him, ‘Thanks, and I won’t let you down.’"
Ozier immediately went outside to call his mother, who screamed into the phone and began telling all her co-workers that her son had finally earned a scholarship. "Thank you, God," Medina recalls thinking. "I remember saying, ‘Oh my gosh, oh my gosh,’ and I called Kevin and he was saying the same thing." As Ozier tells it, Medina called back about 20 seconds after their first conversation to say again how proud she was, and then once more after that to make sure Ozier had called certain relatives and friends. Among those was Redmond, who’d encouraged Ozier more than once to stick it out through the tough times. "I was pretty proud of him," Redmond said. "He got there and he handled his business. And truly, he had more talent than some of the guys that were on scholarship." Erickson had been let go, but Ozier’s hard work had paid off, and it wasn’t just a scholarship he received upon Graham’s arrival. He also got the chance to make an impact, starting 10 games as a junior. In ASU’s road win over Cal, Ozier caught two touchdown passes. He finished the year with five. This year, Ozier has seen a decrease in his involvement, but so have most of ASU’s returning receivers after the arrival of standout Jaelen Strong. Ozier has five touchdowns on 21 catches and 323 yards, 88 of which came on eight catches in a career-best game against Washington when Strong was hobbled by an ankle injury. Despite reduced numbers and fewer opportunities this year, Ozier never complained. How could he after all he’d been through just to be there? Instead, he stepped up like seniors are supposed to, quietly anchoring the receiving corps as ASU won a Pac-12 South title. "Not only did he get a scholarship, but he performed at a high level and he became a leader," Graham said. "No doubt, a lot of the success (in 2013) has to do with the improvement we made at the receiver position, and I think his leadership and work ethic were essential to that." Ozier also paid forward the encouragement he had received from scholarship players when he was a walk-on. He has pushed walk-on receiver Frederick Gammage to keep working hard to get noticed. Ozier has also pushed redshirt junior defensive back Jordan Simone, a walk-on who transferred from Washington State, to go hard in practice, just as defensive backs once told him. "We always go back and forth and get on each other after plays," Simone said. Simone’s father, Ron, walked on as a receiver at ASU in 1983, so he had always known an example of a walk-on making it. In Ozier, though, Simone has proof right in front of him. "He’s such a leader, and when I think about what I want to do at this school, he’s a really good example of what a walk-on making it looks like," Simone said. "He’s been such a blessing to have." Ahead of Monday’s game against Texas Tech, Medina has tried to scare up as many No. 82 jerseys as she can. There won’t be enough for the contingent of at least 50 friends and family on hand to see Ozier’s first game in San Diego since 2008. "I probably need more tickets," Ozier joked. 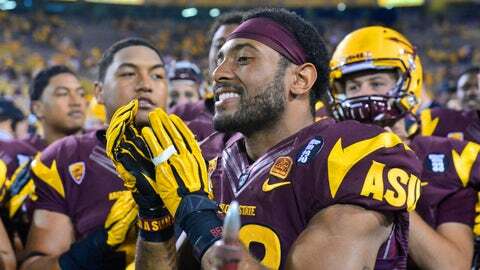 The return will be special, Medina said, but it’s unlikely to match what 20 or so family members and friends experienced last week in Tempe as they watched Ozier walk across a stage to accept his degree in interdisciplinary studies with an emphasis on education and sociology. "Oh my gosh," Medina said. "I was just looking at my baby boy and thinking, ‘He did it.’ He persevered and he hung in there and made it happen no matter what." There were plenty of tears in the audience that day as Ozier became the first member of his family to graduate from college. It made everything he and his family had endured worth it. "I was waiting at the stage for the people to keep going so I could give them my name card so they could call my name, and it was just flashbacks of freshman year and sophomore year and junior year — just a whole lot of homework and work," Ozier said. "Everything just flashed back and it was like, ‘I’m done. I did it.’"
Now, Ozier gets to go home and show his friends and family just what he has accomplished since leaving San Diego in 2009. He hopes to catch a touchdown in the game but says that even if he doesn’t, he’ll block as hard as ever. After that, Ozier plans to start training for a shot at the NFL. He’s not likely to be drafted, but hard work hasn’t failed him yet. He walked a long, hard road to play Division I football, get a scholarship and earn a degree. Professional football is just next on the list. "In high school, I had the dream of playing Division I college football," Ozier said. "It didn’t come easy, but that’s why you chase your dreams and work for them. "And after you accomplish a goal, you set another one."